viewfromaloft: Before & After L.A. 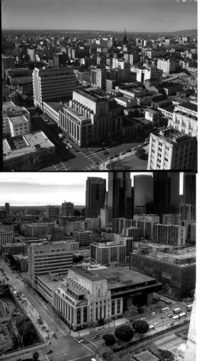 Downtown Vid Pic: "Arroyo Seco Parkway"
Figueroa And Temple, then and now. 1939 via Caltrans. Current image via Googlemaps. Caltrans District 7 dug in the archives for this 16mm Kodachrome footage of Arroyo Seco Parkway. Some portions date back to 1939. The parkway was dedicated on December 30, 1940. "It was something previously unseen in the western United States – a lushly landscaped pleasure ride that was capable of handling speeds up to 45 miles per hour," wrote Caltrans in 2011, the 70th Anniversary of the corridor. In the clip, onward through the Figueroa Street Tunnels you shall go before the commute ends at Figueroa and Temple. Angels Flight, 3rd and Hill Street circa 1910. Note the "vegetarian cafeteria" on the right. Angels Flight, 3rd and Hill Streets circa late 60s. Angels Flight car Olivet being placed back on the tracks, November, 2008. Angels Flight reopens Monday, March 15, reports blogdowntown. As the press release says "Bring quarters." Meanwhile, CurbedLA notes that a soft opening on Saturday, continued today, Sunday. After nine years, Downtown has changed. Maybe the changes around Bunker Hill are not as dramatic as previous opening and reopening days, but it is a different urban core. Now the question is, how can Angels Flight it be part of Art Walk? 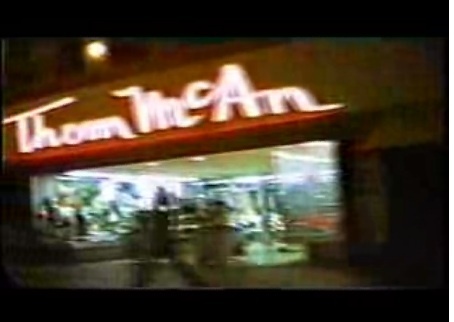 Thanks to YouTube, scores of amateur videos of Downtown Los Angeles are being posted (mostly taken from a moving car.) Here is one from 1988 by "Meadowlawn" who video taped the street while being driven north on Broadway. Some of the Historic theaters were still operating as movie houses and you can spot businesses now gone, including a FatBurger. 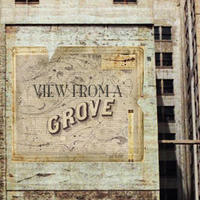 The shaky tape has a good choice of background music and offers an interesting peek of a Downtown LA from 20 years ago. Click on Downtown Los Angeles at Night. From the UCLA Special Collections Archive is the "cityscape seen from top of city hall tower looking south in Los Angeles, CA", circa 1950. 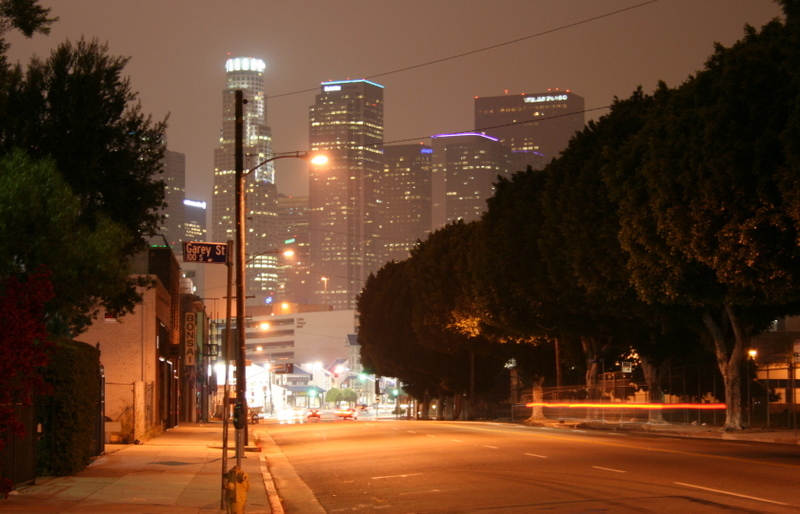 Below is a photo of Downtown Los Angeles from the same angle in March 2007, from the viewfromaloft archives. On the way back to the loft, I was trying to picture the trees that once lined First Street at Vignes, just at the foot of the First Street Bridge. After hunting down this photo I took in May of 2005, I was surprised how they were larger than I remembered. 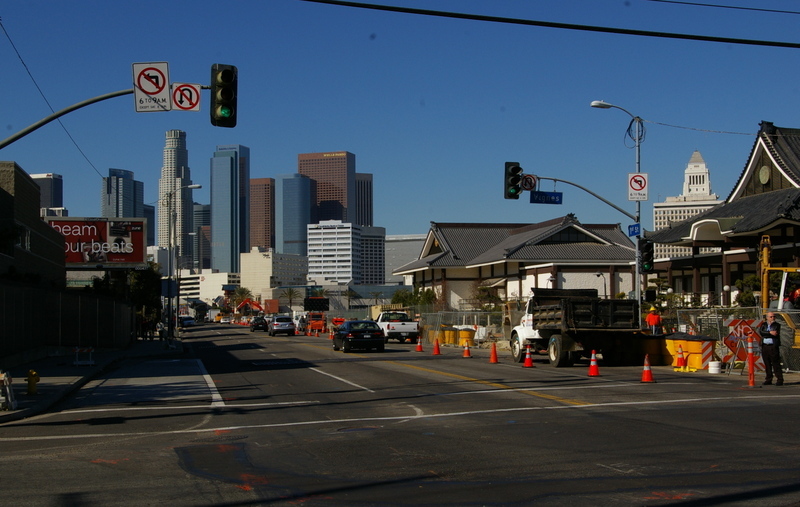 Of course, with the ongoing construction for the Metro Gold Line extension along that side of the street, these tree are all gone. 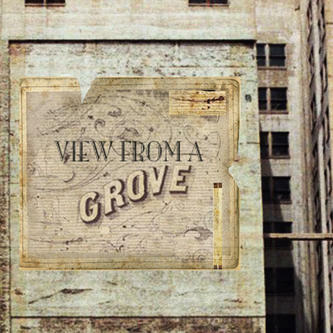 Welcome back to our blotter,View From a Grove. In our part of this growing city just east of Los Angeles near the river, dwellings, hotels and factories have taken residence displacing the fields and groves. This blotter may have to consider changing it’s moniker. CONTACTS: Our friends at the La Grande Station at Santa Fe Avenue and Second Street continues to note the many visitors arriving. The Parmelee Dohrmann Warehouse across from the famed Santa Fe Station brings news from the hotels as they deliver their fine china. The Anhueser-Bush Brewery Association at Vignes and Second Street are our eyes and ears in the restaurants and pubs. In full view and disclosure we name them, for they bring View From a Grove important tempered news about the changes in this city. We leave the tabloid style to the former staff at The Herald, where ever they may end up. As we enter 1913, here‘s some news from the past year when you turn the page. From ongoing series in and around downtown Los Angeles. First published May 2006.